We live in a time where people are quick to label others. However, too often the labels we give to others have nothing to do with whom they really are. Instead, we label them to judge them as being someone or something that is undesirable or wicked. Therefore, before we apply any label or name to identify wickedness, we must seek God’s wisdom in how it applies and the words God uses. What name does God give to the wicked? How Can we Trust That God is Able to Rightly Label Anything Truthfully? God is omni is omniscience. This means that He is all knowing – He knows everything. He knows the past, present, and future. He knows how things work and why they work. He even knows our thoughts better than we know them (Psalms 139:1-4; Psalms 147:5; Isaiah 46:10; Romans 11:33-34; Hebrews 4:13). Because God is all knowing, He has the ability to see a person’s heart, which gives Him a true picture of the person. It is with this in mind, we can know that when He names something or someone, it is 100% true (Psalms 96:13; Psalms 33:4; Proverbs 8:7; John 1:17; 1 John 2:8; 1 John 5:20). The common definition of wickedness is (1): “noun: wickedness; plural noun: wickednesses. 1. The quality of being evil or morally wrong.” It was most commonly used between 1650 and 1900, but has steadily decreased since then. It was also most commonly used as an identifier (Wickedness) for Satan in the late 1600s and early to mid-1700s (2). In the Bible, the word wicked is the Hebrew word, “rasa,” meaning wicked, ungodly, or guilty. Loosely translated it communicates the idea of wrongdoing or being in the wrong (3). The word wicked in Greek is the word, “ponayros,” meaning wicked, malicious. A similar word, “athesmos,” adds the translated meaning of lawless or bad. Combined, they communicate the idea of someone that is bad, hurtful, evil, ill, diseased; morally culpable, derelict, or vicious (4). As we can see, there is no shortage of names that God gives to the wicked. However, what is important is that God considered these and other unbelievers as wicked. Therefore, they are not children of God because they have not trusted Christ as their Savior (Romans 8:8-9; Galatians 3:26; 1 John 2:22-23; 1 John 3:9-10; 1 John 4:2-5; 2 John 1:7-10). Because they are not children of God, their end will not be paradise with the Lord in eternity, but instead, in the terror of destruction without the Lord in darkness where there is weeping and gnashing of teeth (Matthew 8:12; Philippians 3:14-21; Revelation 20:5-15). We live in a time where people are quick to label others and often judge them as being someone or something that is undesirable or wicked. However, God is all knowing, He has the ability to see a person’s heart, which gives Him a true picture of the person and whether or not they are wicked. 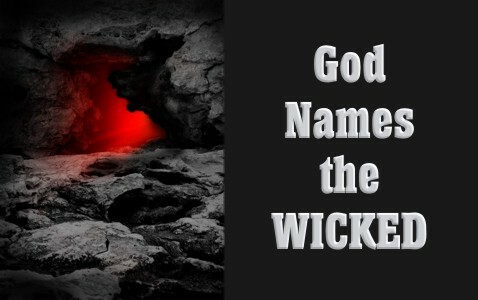 However, God gives many names to the wicked in Scripture. Unfortunately, those whom God names wicked have an eternity coming that is destined to be terrifying. Therefore, it is imperative that all believers make evangelism a priority in their life and live in a way that attracts others to the Lord. In doing so, it is our desire to see them receive a new name as a Child of God. Resources – Scripture quotations are from The Holy Bible, King James Version. (1) Google. (2017). “Wickedness”. Retrieved from Google, https://www.google.com/search?source=hp&q=wickedness&oq=wickedness. (2) Google. (2014). “Wickedness”. Retrieved from Google, https://books.google.com/ngrams/graph? content=wickedness&case_insensitive=on&year_start=1500&year_end= 2017&corpus=15&smoothing=7&share= &direct_url=t4%3B%2Cwickedness%3B%2Cc0%3B%2Cs0%3B%3Bwickedness %3B%2Cc0%3B%3BWickedness%3B%2Cc0. (3) Vine, W. E., Merrill F. Unger, and William White. Vine’s Complete Expository Dictionary of Old and New Testament Words: With Topical Index. “Wicked” Pages 287-288. Nashville: T. Nelson, 1996. Print. (4) Vine, W. E., Merrill F. Unger, and William White. Vine’s Complete Expository Dictionary of Old and New Testament Words: With Topical Index. “Wicked” Pages 287-288. Nashville: T. Nelson, 1996. Print. Previous post: Why Did Jesus Have To Cleanse The Temple?